3. K-III: The squares of the periods are as the cubes of the major axes of the ellipses. In August, MIT researchers identified an exoplanet with an extremely brief orbital period: The team found that Kepler 78b, a small, intensely hot planet 700 light-years from Earth, circles its star in just 8.5 hours—lightning-quick, compared with our own planet’s leisurely 365-day orbit. From starlight data gathered by the Kepler Space Telescope, the scientists also determined that the exoplanet is about 1.2 times Earth’s size—making Kepler 78b one of the smallest exoplanets ever measured. Winn and his colleagues, including lead author Andrew Howard, of the University of Hawaii, publish their results this week in the journal Nature. The group’s results appear in the same issue as a paper published by a separate group in Geneva, reporting similar results—scientific agreement that Winn says adds confidence to the mass measurement. Winn and his colleagues looked to measure Kepler 78’s Doppler shift by analyzing observations from the Keck Observatory in Hawaii—one of the largest telescopes in the world. The team analyzed starlight data taken over a period of eight days. Despite the telescope’s strength, the signal from the star was incredibly faint, making a daunting task for the scientists. Sanchis-Ojeda was able to solve this puzzle by taking into account Kepler 78’s rotational period. By tracking the frequency at which certain starspots reappeared, Sanchis-Ojeda determined that the star completes a full rotation every 12.5 days—considerably longer than the planet’s orbital period of 8.5 hours. From these measurements, Sanchis-Ojeda was able to calculate the star’s true Doppler shift. From his calculations, Sanchis-Ojeda found that the star rotates relatively slowly, at 1.5 meters per second—about the speed of a jog, or a brisk walk. From the star’s Doppler shift, the team determined that Kepler 78b’s mass is 1.7 times that of Earth—a measurement that suggests the planet is made mostly of rock and iron. Such a composition, Winn says, is not surprising, given the planet’s extremely close proximity to its star. A less massive planet, such as one made entirely of gas, would not be able to hold together in such a tight orbit. While its similarities to Earth likely end with Kepler 78b’s size and mass, Winn says there is still more to learn about the planet, such as its surface and atmospheric composition—a goal that the group plans to pursue next. NASA’s Kepler mission has discovered two new planetary systems that include three super-Earth-size planets in the “habitable zone,” the range of distance from a star where the surface temperature of an orbiting planet might be suitable for liquid water. The Kepler-62 system has five planets; 62b, 62c, 62d, 62e and 62f. The Kepler-69 system has two planets; 69b and 69c. 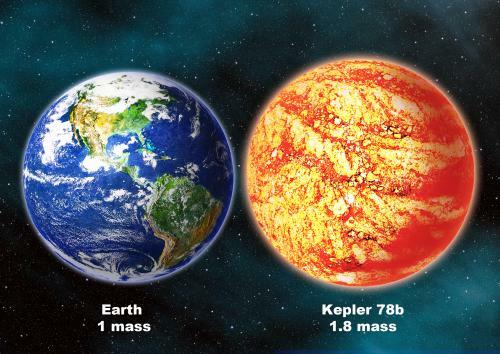 Kepler-62e, 62f and 69c are the super-Earth-sized planets. 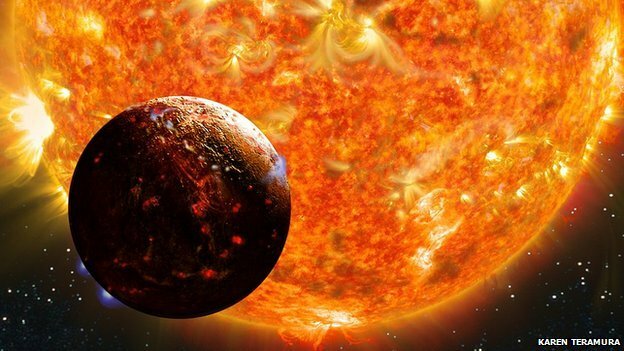 Two of the newly discovered planets orbit a star smaller and cooler than the sun. Kepler-62f is only 40 percent larger than Earth, making it the exoplanet closest to the size of our planet known in the habitable zone of another star. Kepler-62f is likely to have a rocky composition. Kepler-62e, orbits on the inner edge of the habitable zone and is roughly 60 percent larger than Earth. The third planet, Kepler-69c, is 70 percent larger than the size of Earth, and orbits in the habitable zone of a star similar to our sun. Astronomers are uncertain about the composition of Kepler-69c, but its orbit of 242 days around a sun-like star resembles that of our neighboring planet Venus. Scientists do not know whether life could exist on the newfound planets, but their discovery signals we are another step closer to finding a world similar to Earth around a star like our sun…. We study planetesimal evolution in circumbinary disks, focusing on the three systems Kepler 16, 34 and 35 where planets have been discovered recently. We show that for circumbinary planetesimals, in addition to secular forcing, eccentricities evolve on a dynamical timescale, which leads to orbital crossings even in the presence of gas drag. This makes the current locations of the circumbinary Kepler planets hostile to planetesimal accretion. 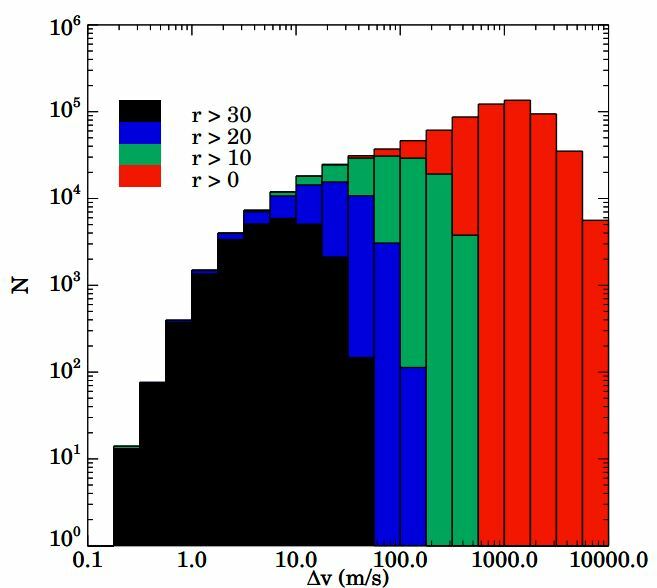 We then present results from simulations including planetesimal formation and dust accretion, and show that even in the most favourable case of 100% efficient dust accretion, in situ growth starting from planetesimals smaller than ~10 km is difficult for Kepler 16b, Kepler 34b and Kepler 35b. These planets were likely assembled further out in the disk, and migrated inward to their current location…. Since science operations began in May 2009, the Kepler team has released two catalogs of transiting planet candidates. The first catalog (Borucki et al, 2010), released in June 2010, contains 312 candidates identified in the first 43 days of Kepler data. The second catalog (Borucki et al, 2011), released in February 2011, is a cumulative catalog containing 1,235 candidates identified in the first 13 months of data. Now the team presents the third catalog containing 1,091 new planet candidates identified in the first 16 months of observation conducted May 2009 to September 2010. These are the same candidates that the team discussed at the Kepler Science Conference held at NASA Ames Research Center in December 2011. Planet candidates smaller than twice the size of Earth increased by 197 percent, compared to 52 percent for candidates larger than twice the size of Earth. Planet candidates with orbital periods longer than 50 days increased by 123 percent, compared to 85 percent for candidates with orbital periods shorter than 50 days. Since the last catalog was released in February 2011, the number of planet candidates identified by Kepler has increased by 88 percent and now totals 2,321 transiting 1,790 stars. The cumulative catalog now contains well over 200 Earth-size planet candidates and more than 900 that are smaller than twice Earth-size. Of the 46 planet candidates found in the habitable zone, the region in the planetary system where liquid water could exist, ten of these candidates are near-Earth-size. 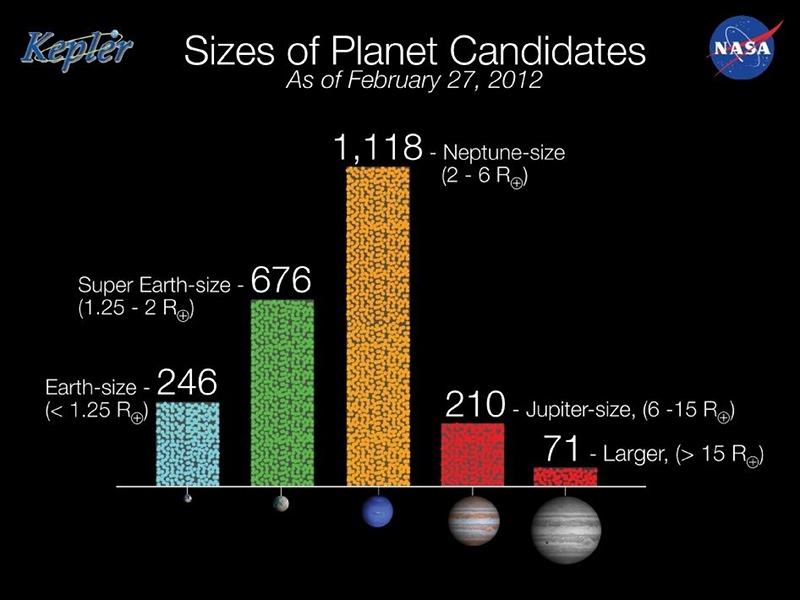 The number of planetary systems found with more than one planet candidate also has increased. Last year, 17 percent, or 170 stars, had more than one transiting planet candidate. Today, 20 percent, or 365, stars have more than one. Nearly 5,000 periodic transit-like signals were analyzed with known spacecraft instrumentation and astrophysical phenomena that could masquerade as transits, which can produce false positives. The most common false positive signatures are associated with eclipsing binary stars- a pair of orbiting stars that eclipse each other from the vantage point of the spacecraft. The Kepler space telescope identifies planet candidates by repeatedly measuring the change in brightness of more than 150,000 stars in search of planets that pass in front, or “transit,” their host star. Kepler must record at least three transits to verify a signal as a planet. The planets orbit close to their host stars and range in size from 1.5 times the radius of Earth to larger than Jupiter. Fifteen of them are between Earth and Neptune in size, and further observations will be required to determine which are rocky like Earth and which have thick gaseous atmospheres like Neptune. The planets orbit their host star once every six to 143 days. All are closer to their host star than Venus is to our sun. Kepler identifies planet candidates by repeatedly measuring the change in brightness of more than 150,000 stars to detect when a planet passes in front of the star. That passage casts a small shadow toward Earth and the Kepler spacecraft. Each of the new confirmed planetary systems contains two to five closely spaced transiting planets. In tightly packed planetary systems, the gravitational pull of the planets among themselves causes one planet to accelerate and another planet to decelerate along its orbit. The acceleration causes the orbital period of each planet to change. Kepler detects this effect by measuring the changes, or so-called Transit Timing Variations (TTVs). Planetary systems with TTVs can be verified without requiring extensive ground-based observations, accelerating confirmation of planet candidates. The TTV detection technique also increases Kepler’s ability to confirm planetary systems around fainter and more distant stars. Five of the systems (Kepler-25, Kepler-27, Kepler-30, Kepler-31 and Kepler-33) contain a pair of planets where the inner planet orbits the star twice during each orbit of the outer planet. Four of the systems (Kepler-23, Kepler-24, Kepler-28 and Kepler-32) contain a pairing where the outer planet circles the star twice for every three times the inner planet orbits its star. “These configurations help to amplify the gravitational interactions between the planets, similar to how my sons kick their legs on a swing at the right time to go higher,” said Jason Steffen, the Brinson postdoctoral fellow at Fermilab Center for Particle Astrophysics in Batavia, Ill., and lead author of a paper confirming Kepler-25, 26, 27 and 28.